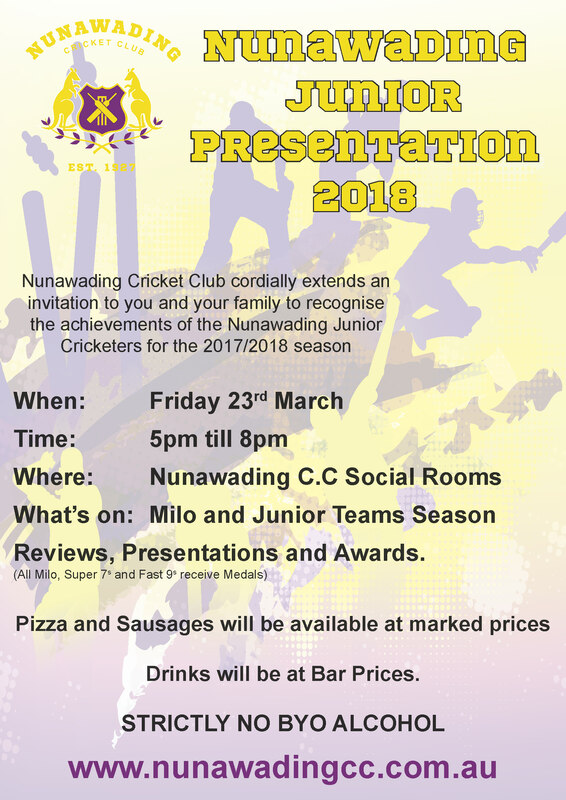 Just a reminder that tomorrow night is our Junior Presentation Night. It will be a great way to celebrate the season – a season which I hope everyone has enjoyed. · As many people as possible be present for dinner (6.00pm – 6.45pm) and the Dave Cowell Award, highlights of the season and a look back at the last 10 years of the Junior Program (6.45pm – 7.00pm). · I also hope that families are able to stay and watch other teams be presented with their awards – especially those either side of the dinner break. Would love our club rooms to be full of U12, U14, Girls and U16s – at 8.00pm, so that they can see the U18s presentation. We will also have a raffle throughout the night. We have quite a few prizes, which are displayed on the table at the front of the room. When tickets are being sold, your name will be recorded on the ticket – so if you are not there at the end of the night when the raffle is drawn, you can still receive your prize. There is no compulsion to purchase tickets, however obviously you have to be in it – to win it! !